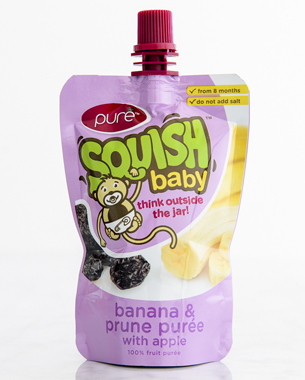 The Squish Baby range of baby food packaging was designed as part of a range extention to the client’s existing range of puréed fruit smoothies aimed at toddlers and younger children. Taking cues from the existing range, a softer version of the logotype was developed, to create a more baby-friendly feel. The existing toddler range uses a monkey character as a primary graphic device, so a baby monkey was introduced as part of the Baby Squish logotype. A soft, pastel colour palette was chosen, and clean photography of the ingredients was developed to create simple, and clear communication of the different flavours.